Time to share the first mini clock and calculator combo from Casio. An unusual design, the MQ-1 horizontal layout, and yellow-tinted LCD. As you’ll later discover in the ‘Pocket Calculator Museum’, the succeeding models in the MQ line offer more features, but none may be quite as charming as their first. 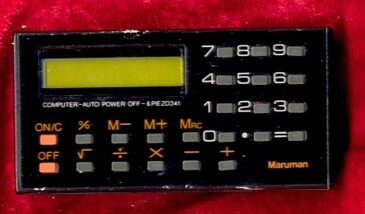 This micro-computer has a hinged cover on the right to expose calculator and setting buttons for the clock, stopwatch and calculator. Remarkable Casio quality in a tiny package could be attained in 1977 for about $50. These have jumped in demand over the last few years: news was uncovered that the MQ-1 was used as a prop for Star Wars character Boba Fett. We found this gem tucked away in an gift shop on Canal Street in New York City. Casio’s Championship Derby 2 was an exotic horse racing game calculator that unfolds to show its display in the upper panel and game controls and calculator functions in the lower one. Object of the game is simple, simply push the buttons quickly enough to get your horse ahead to win the race. There are obstacles that your horse and jockey must hurdle, and your competition is not all that easy. The sound on this one is quite good, and we love the membrane keys. There’s a little map of the track in the upper right corner indicating where you are in the race. Very sophisticated little calculator game–this is only game with such a design that we’ve ever seen. Have you seen others like the KG-200? 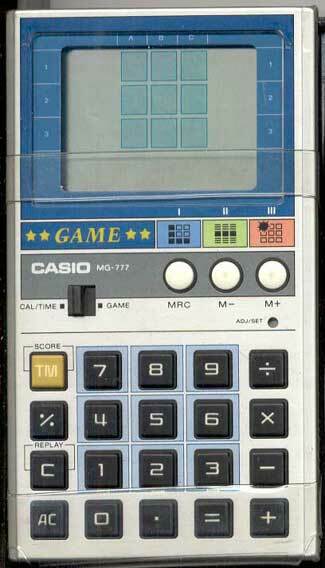 Here’s another unusual game calculator by Casio, the MG-777. We determined that one of the games on this one is tic-tac-toe, but aren’t sure of the other two. In addition to calculator functions and game play, this one offers a clock. This model is reminiscient of Parker Bros’ Merlin, that great LED handheld game from the ’70s. There was a time when most people actually carried around checkbooks and paid for things with check! 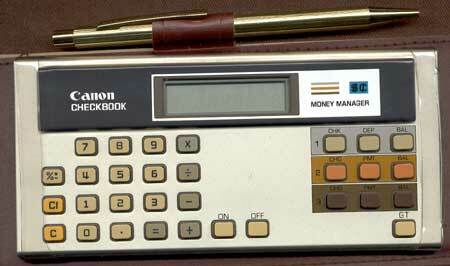 To assist with balancing your books there was Canon’s checkbook calculator, the Money Manager. It’s a real checkbook, with a holder for this neat calculator. Geared for personal banking, it has three memory banks, and quick access buttons for checks and deposits. Those of us without the Money Manager were required to use the add and subtract buttons. Wow, this one is mind-blowing. The PB-2000C was more computer than calculator: it programmed in C!! C is a powerful programming language upon which many programs are built: operating systems, web servers, word processing programs, etc. As far as we know, this is the only pocket computer capable of coding in this powerful language. The PB-2000C has 32K of RAM and a ROM card slot, allowing for expandability. Prolog and BASIC were advertised to be distributed in this format for this computer, but we haven’t seen them. There was also a slot for and additional 32K of RAM and an interface to plug the system into an MD-100 base. The base contained a 3 1/2 floppy disk drive and an RS-232C interface and a Centronics port for a printer. Absolutely incredible power in a pocket-sized form factor. Who else but Casio? The Seiko DF-1220 was yet another high-priced gadget marketed for travelling execs and such. 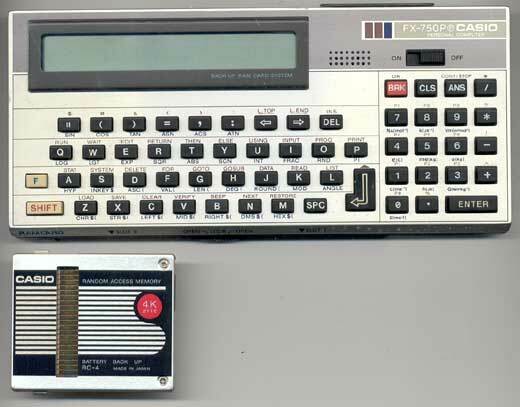 The DF-1220 Expense Recorder was part of the Pocket Logic Series and featured 8K of memory, a travel clock and calendar. Shortcut keys for typical travel expenses were handy, but we feel the tiny display limited the usefulness of this device. Don’t be deceived by its unassuming looks–this baby packs quite a punch, functionally speaking. 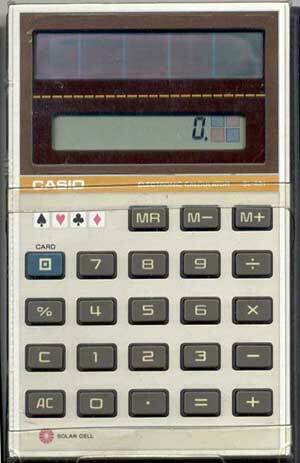 In the early ’80s, Casio sought to provide a do-it-all device for the travelling businessman or busy student. 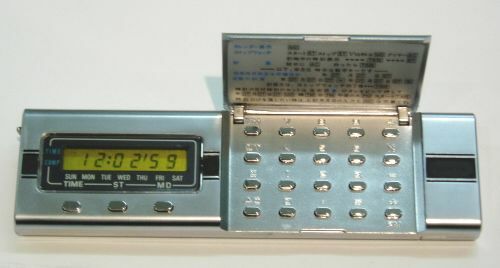 The TA-1000 provides a nice calculator, a clock and a datebook of sorts (actually an array of six alarms each with a unique “chime”) in a slim and lightweight package. Take a look at the display, isn’t the day listing on the bottom pretty sweet? But you’ll agree the topper is the multiple alarm notifications which can be demonstrated by Jay here. 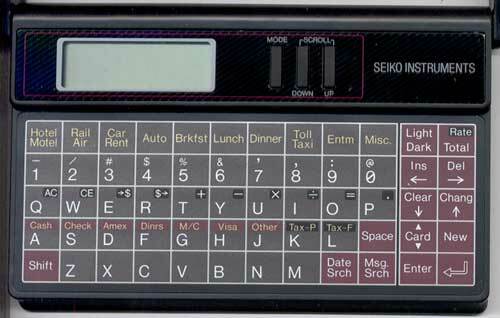 Another feature-packed handheld computer by Casio, and this one’s expandable. The RC-4 module you see underneath packs a whopping 4K of Random Access Memory, giving you all the storage you could possibly need. Cautious programmers would probably use the card for backup purposes. This FX-750P offered two exansion slots; the FX-720P offered one. Coupled with the FA-20 mini-character printer and cassette recorder, this little thing became a formidable portable computer.